By this time of year, healthy eating may have taken a back seat to summer vacation, back-to-school craziness, and for many of this, August is the second “New Years”. This is the perfect time of year to reboot your healthy eating, leaving late breakfasts and daily fro yo treats behind. 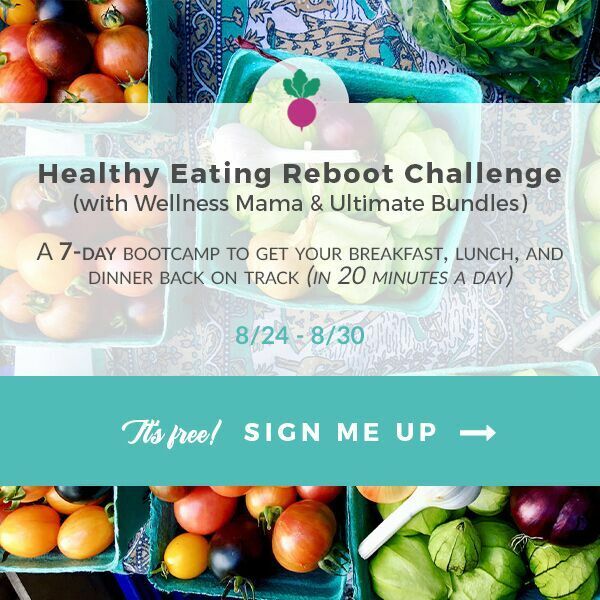 If you need help getting back in the “healthy saddle” again, the folks at Ultimate Bundles have teamed up with Katie from WellnessMama.com to offer a FREE 7-day Healthy Eating Reboot Challenge. Join Ultimate Bundles and Wellness Mama for the challenge right here. Hope you join us in this challenge! It’s back to school time once again, and this year is the most challenging one yet. We have 2 kids in high school, but two different high schools! What a blessing it is to have options for kids who are not “one size fits all”, but it sure makes for some crazy scheduling. Add in sports and work schedules, and I could be driving all through the early evening. 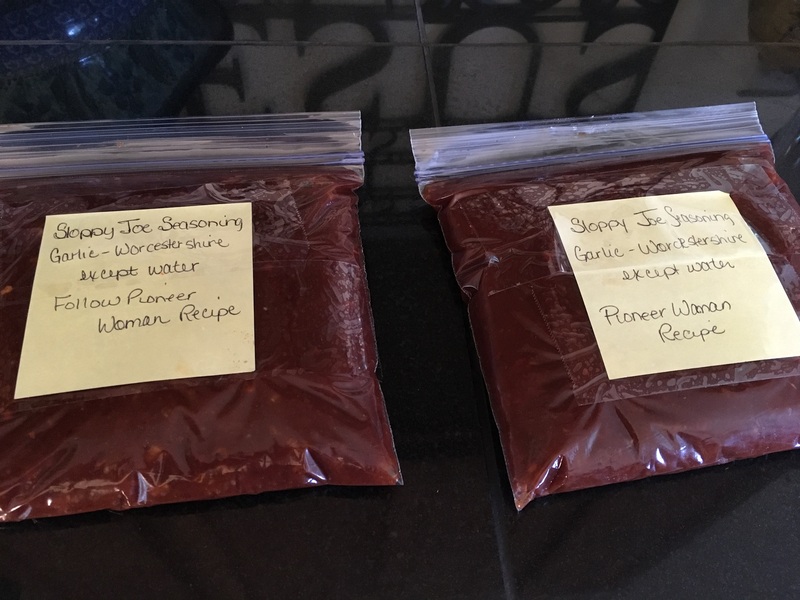 To help get dinner on the table in a timely manner I decided to start filling the freezer with some meals, and sauce packages. For this first run of fall freezer cooking, I pulled out recipes for some favorites, and one new recipe. I picked up several packages of chicken from Sprouts, so that’s what I started with. Cashew Chicken is a new one for our family, and we’ll try it out early next week. The Sesame Chicken is an absolute favorite, and we like to pull together some fried rice to toss the chicken into. For the Sloppy Joes, I just mixed up the sauce ingredients, which is the most tedious part of making this family favorite. Now whoever is making dinner just has to chop a couple of veggies, brown the beef and then add the sauce packet. The Chili Taco Seasoning is a mix I make several times a year. It’s called Taco Seasoning, Mexi Spice or Chili Seasoning around here. That’s why it seems to be named differently within the blog posts. We use it for Tacos, Burritos, Chili, Rice & Beans, you name it. 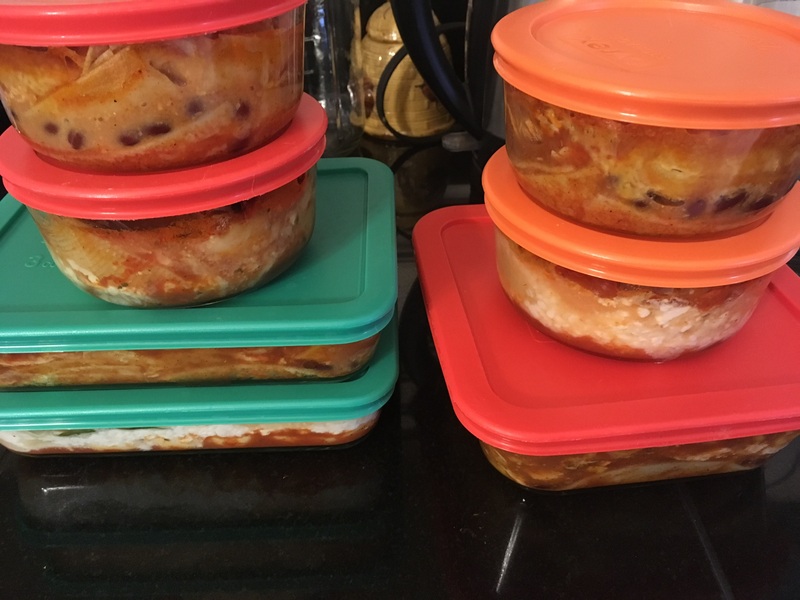 I also put together several individual meals for my daughters who work. Their shifts often are over the dinner, or lunch hours, so it is great to have some food for them to grab and go. There is a microwave at their place of employment, so I think these meals work great. 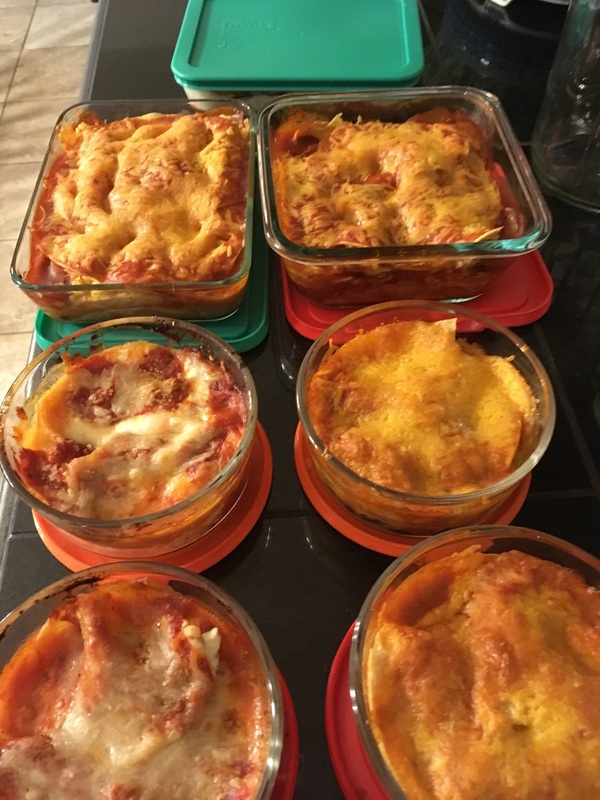 This time I made shells and cheese and enchiladas. 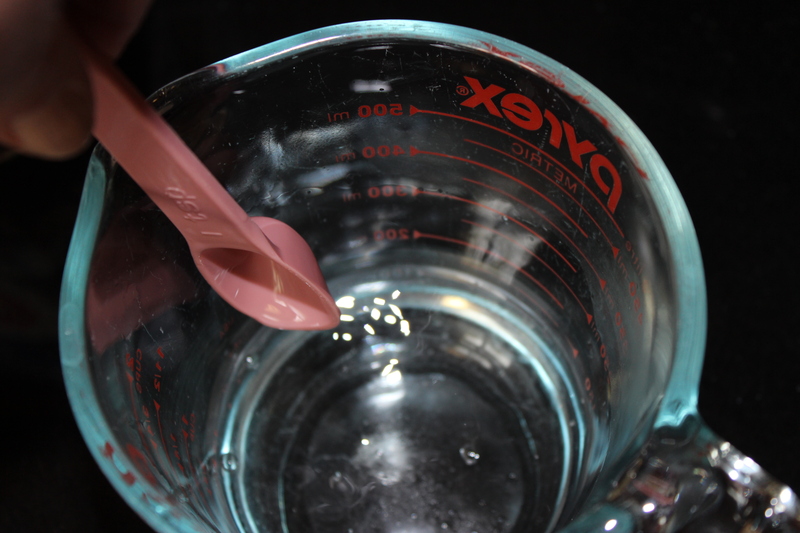 I love these pyrex bowls! We also put together about 2 dozen breakfast burritos, and some bean & cheese burritos that should make the dash out the door easier in the morning or between school and work. Just this one activity helps ease the tension I am feeling about the fall schedule. I work hard at not letting anxiety take a hold in me, but this month it’s been a tough fight. Getting food in the freezer, and telling everyone what’s what has helped quite a bit. Now to finish sorting out how to get to two different schools by 7:30, without dropping someone off crazy early! 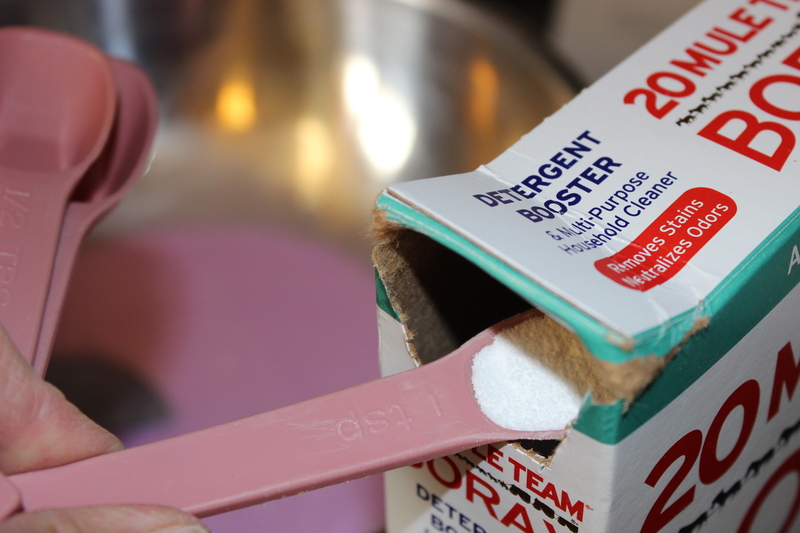 Are you filling your freezer in anticipation of the fall back to school season? What are your favorite recipes? 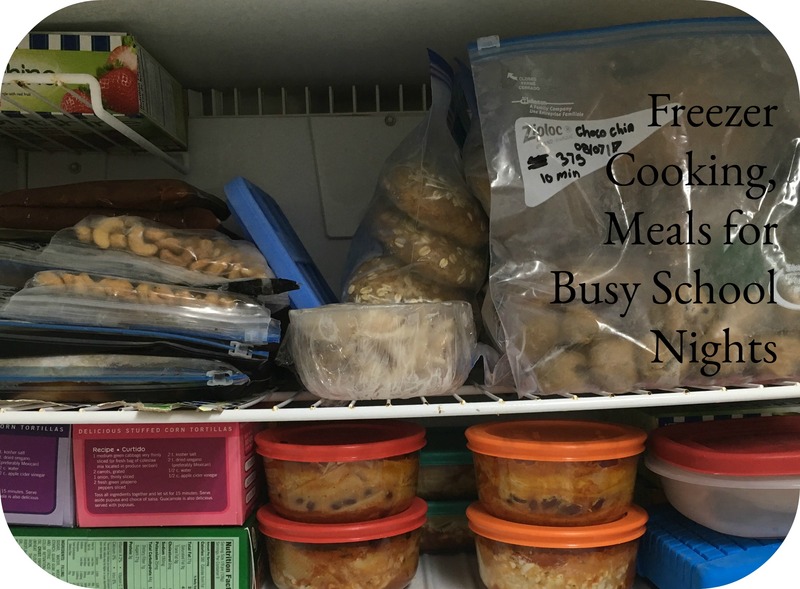 In all the back to school preparation and activity, I designated this past weekend for freezer cooking and other meal prep. 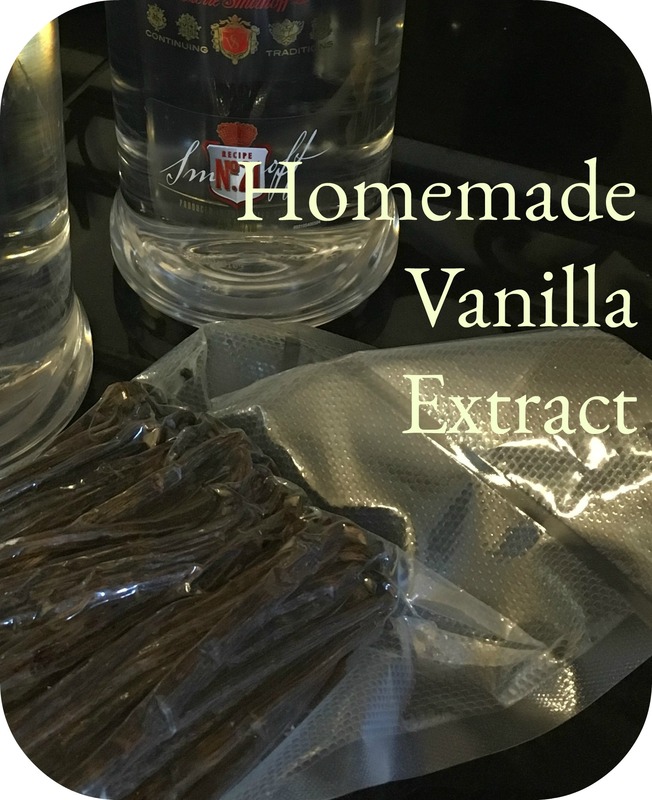 As I made the plan and gathered ingredients, I found a package of vanilla beans in the produce drawer and added homemade vanilla extract to my list. I put two of the half gallon mason jars into the dishwasher, grabbed my short grocery list and stopped by the liquor store that is near our local grocery store. It’s been quite awhile since I’ve been in a liquor store (since the last batch of vanilla extract) and I was so surprised by the babies tending the store. Surely they are not old enough to be working in a liquor store! So young, in fact, that they didn’t know they are supposed to ask me for id. All that aside, on Sunday while one of my daughters made 2 dozen breakfast burritos for the freezer, I made the vanilla extract. It is a very simple recipe, about 80 vanilla pods, snipped lengthwise to reveal the beans inside. Two half gallon mason jars with these plastic lids. Two large bottles of vodka, 1.75 liters each. 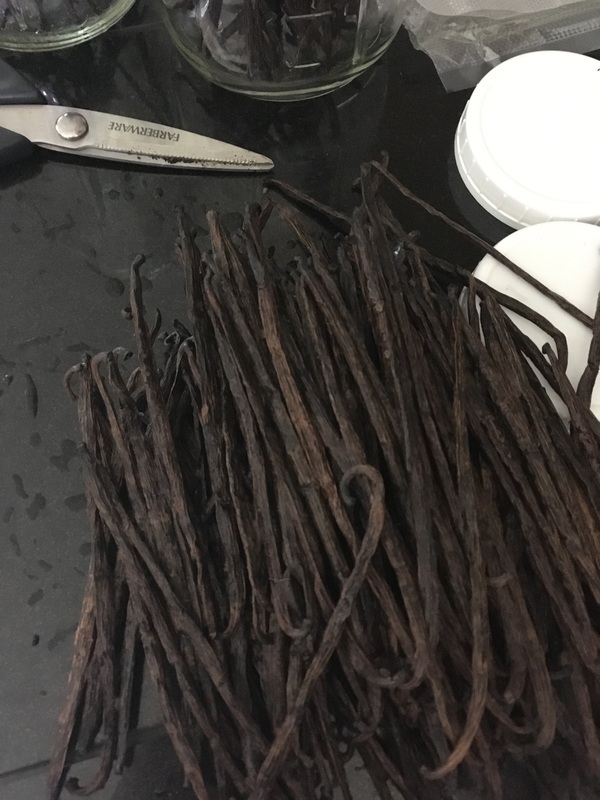 Vanilla Beans, nearly invisible on black counter tops. 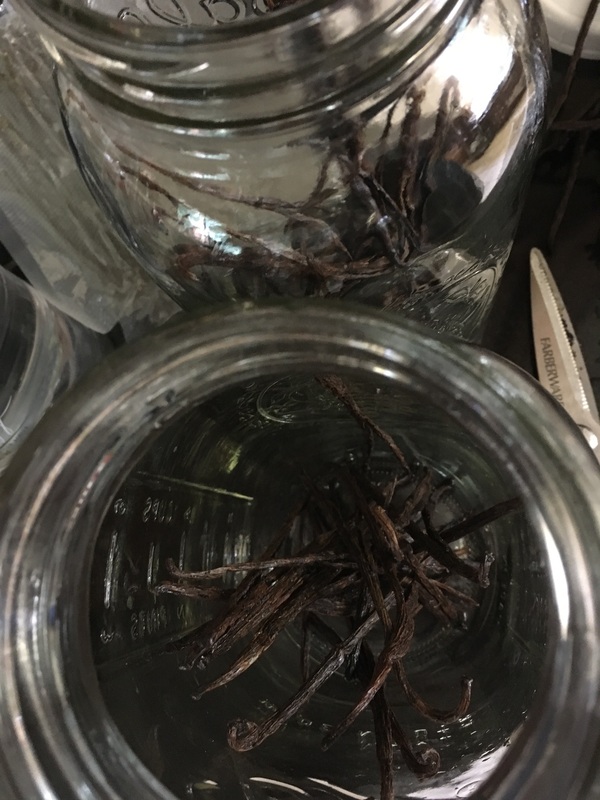 After snipping each vanilla bean, and nearly wearing a hole in my finger where the scissors rub, drop into the glass jars. Then fill each jar with the vodka, put on the lid, and stash in the back of a cabinet where it is good and dark, for 4-6 months. 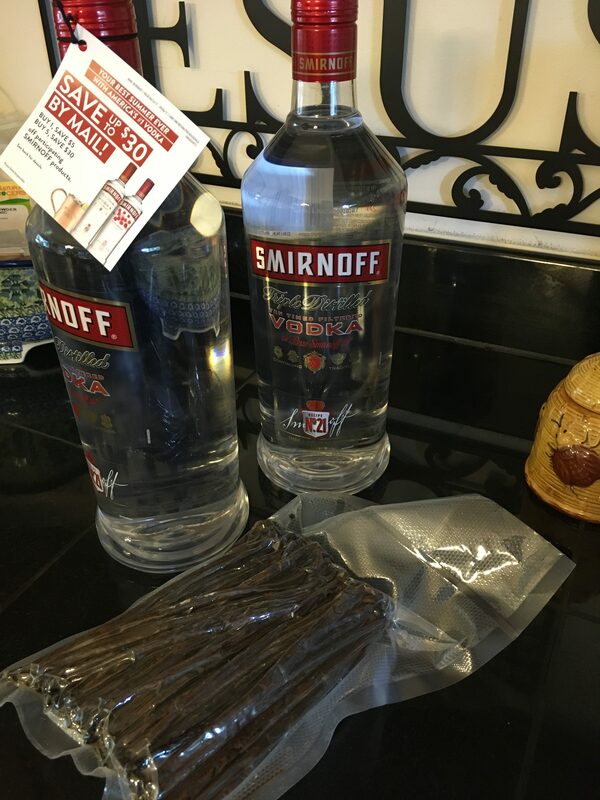 Now we’ll have homemade vanilla extract to bottle for gifts and home use in February! Does getting breakfast on the table, before everyone has to head out, seem to escape your lists and planning? How would you like 4 healthy, filling breakfast ideas that you can prep on the weekend, and feed the family for breakfast all week? “What is for breakfast?” This is a question that will often throw me for a loop, and my early morning has the potential for going south. Monday might be my favorite day of the week, but Sunday is my favorite prep day of the week. On Sunday, after church, I serve one big meal, then let the family have popcorn, sandwiches or cereal later in the day. 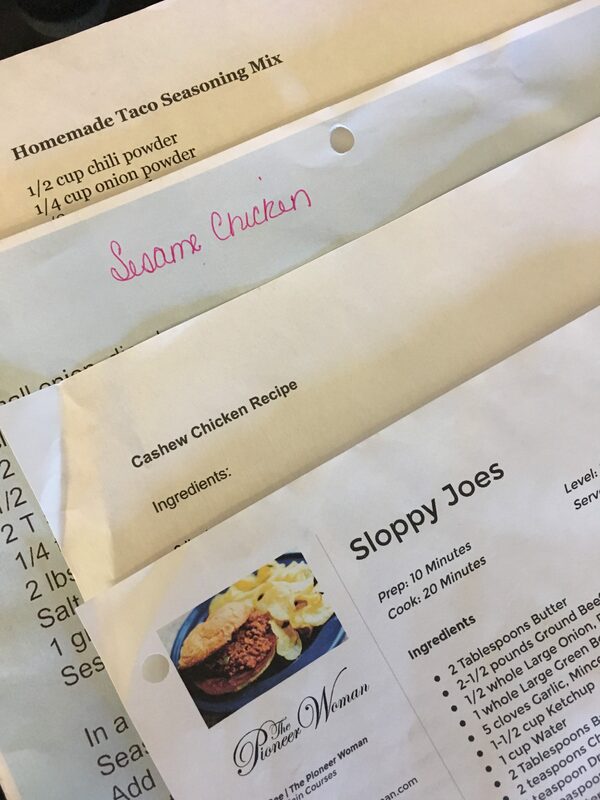 After taking some time to sew, read or nap I head back to the kitchen to menu plan and to prep veggies or freezer bags for the coming week. The only thing about that plan and all the prepping? I seem to forget breakfast on a regular basis. Realizing this, I decided to make breakfast a priority. With the following recipes and a little prep work, we can look forward a tasty, healthy meal on the table each morning. 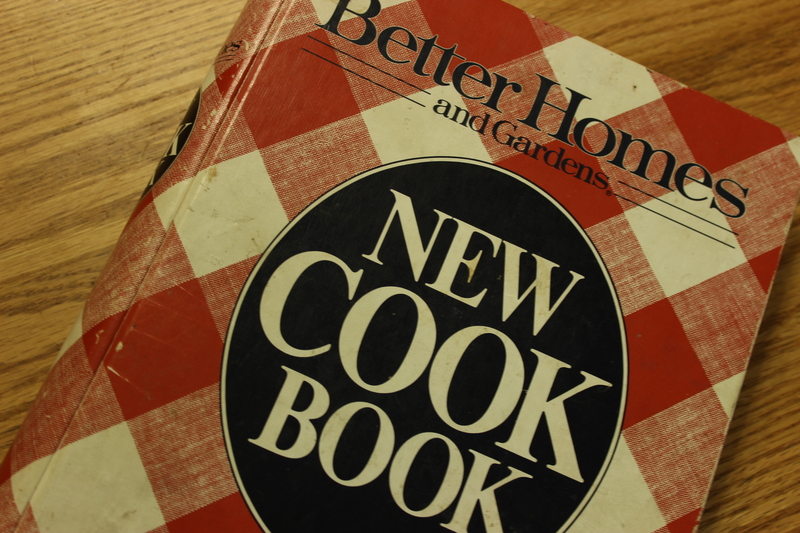 The basic recipe that I use comes from this cookbook. 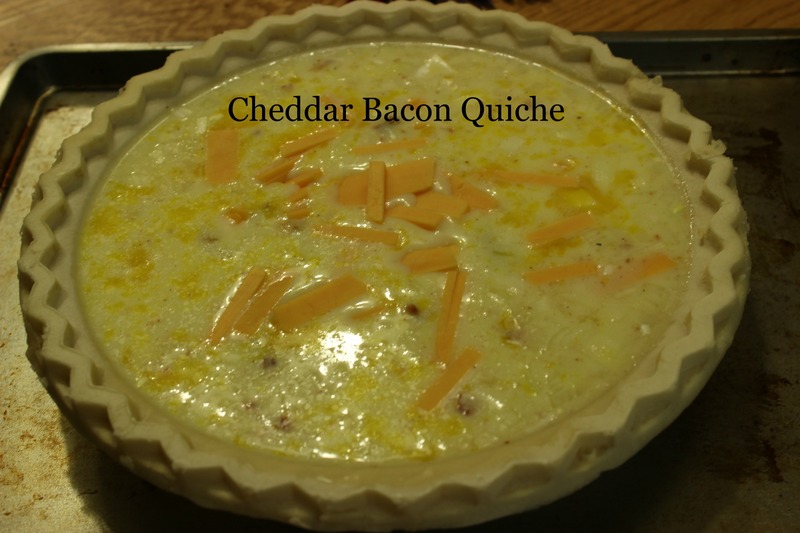 Our favorite version of the recipe is to add cheddar cheese, sauteed onion and fried bacon to the egg and milk mixture. Sometimes I make two of these quiches on the weekend. After they have baked and cooled, I slip each into a ziploc and place in the freezer. The night before serving I put a quiche in the fridge to thaw, then warm in the oven while I have my quiet time. When I’ve finished my quiet time, the quiche is hot and ready to be served. Muffins! I love to prepare muffins for my family. 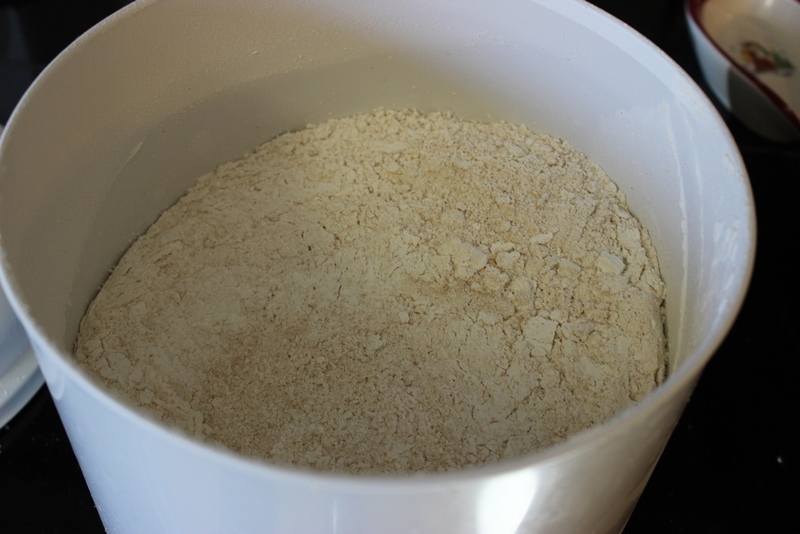 We purchase grain in bulk and mill it into flour. 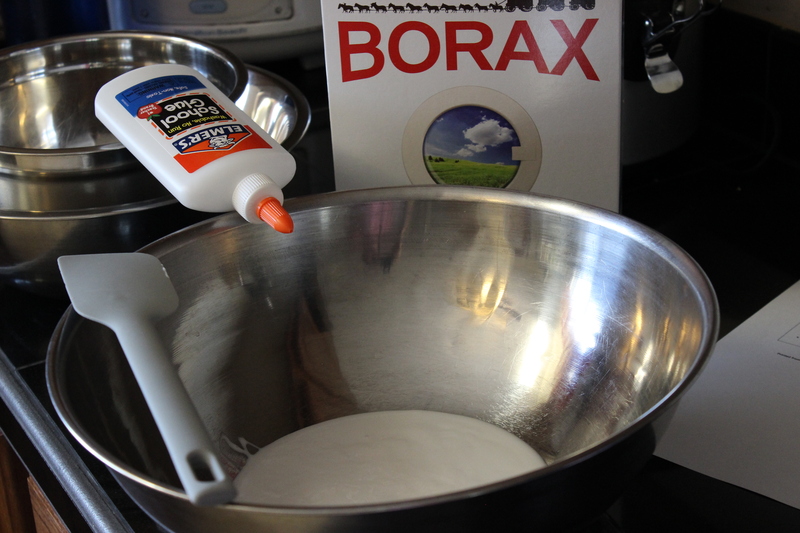 Every few weeks I mill a bucketful of flour and prepare gallon bags of muffin mix, and of the pancake mix. These are stored in my freezer. 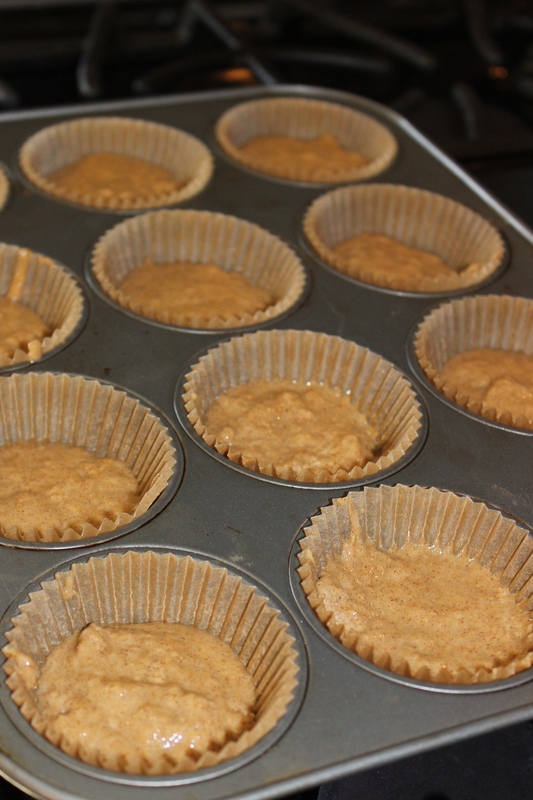 To make the muffin mix, I triple the dry ingredients from this recipe and put into the ziploc. With this muffin mix I can get about 3 batches of muffins. Usually I will make about 2 dozen muffins twice a week. The family will start eating a batch for breakfast, then pack the leftovers into their lunches, or eat them as a snack throughout the day. Having a bag of wheat pancake mix in the freezer makes for a simpler breakfast. On another day I’ll pull the pancake mix out and prepare a stack of pancakes. For the muffins and the pancakes, I either make them plain, or add fruit that we have on hand, like bananas, apples or berries. On pancake mornings I put maple syrup, butter and nut butters on the table. My kids eat peanut butter (I used to be very allergic so I don’t touch the stuff! ), I enjoy almond butter, and the littlest kiddo in the family spreads sunflower butter on her pancakes. 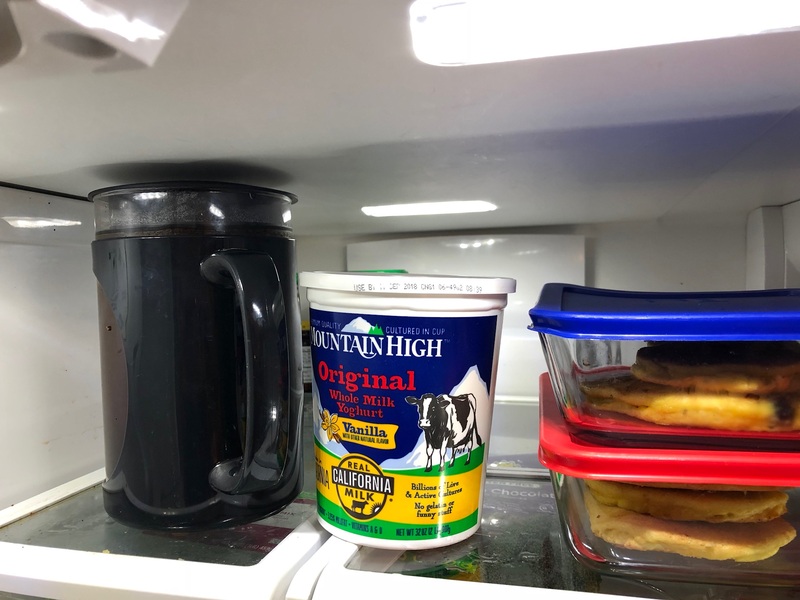 Another time saving, breakfast tip… save the left over pancakes in the fridge, or even the freezer, to be reheated on another day! Breakfast is an important part of a successful day. Feeding the body also feeds the mind, which is very important for school age children who are in the process of filling and exercising their brains as they learn and prepare for adult life. So before sending my children off to school or other activities, feeding them a good breakfast has become a more successful endeavor. 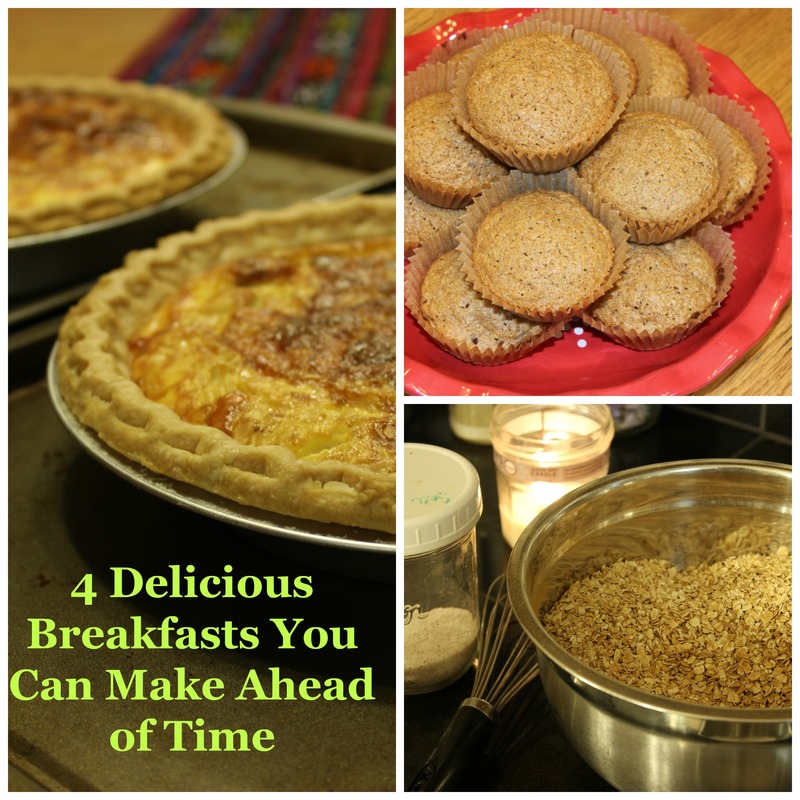 For more breakfast ideas, check out my breakfast pinterest board. Now that school is out for Summer, I am looking forward to actually doing some of the projects and making some of the foods from my pinterest boards. I’ve made a Did It! board and will be blogging about some of my successes, and a flop here & there is likely too. 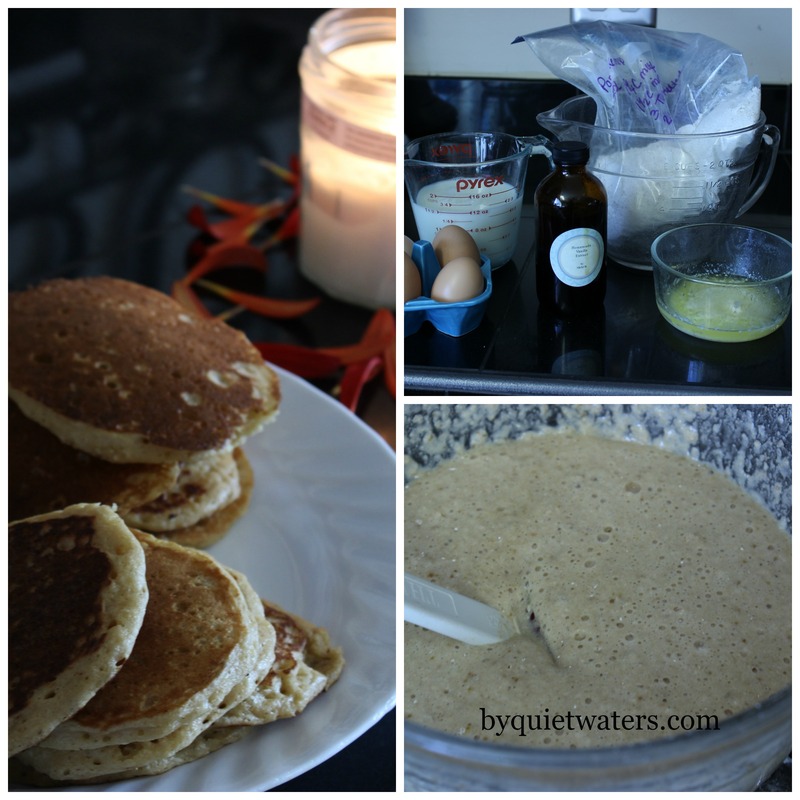 This week I made Carrot Cake Pancakes. 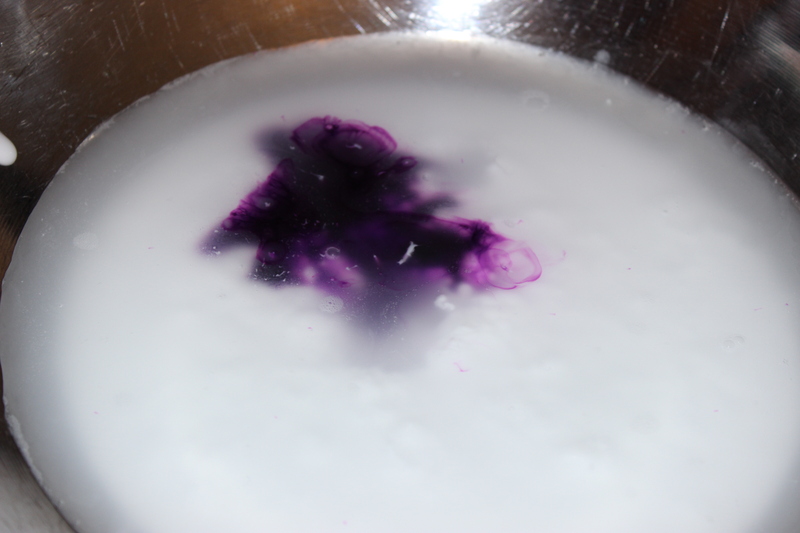 The batter looked lovely to me, but some of my kiddos walked in and sincerely questioned what I was making. Each of the kids did eat some of the pancakes but they were not a hit. 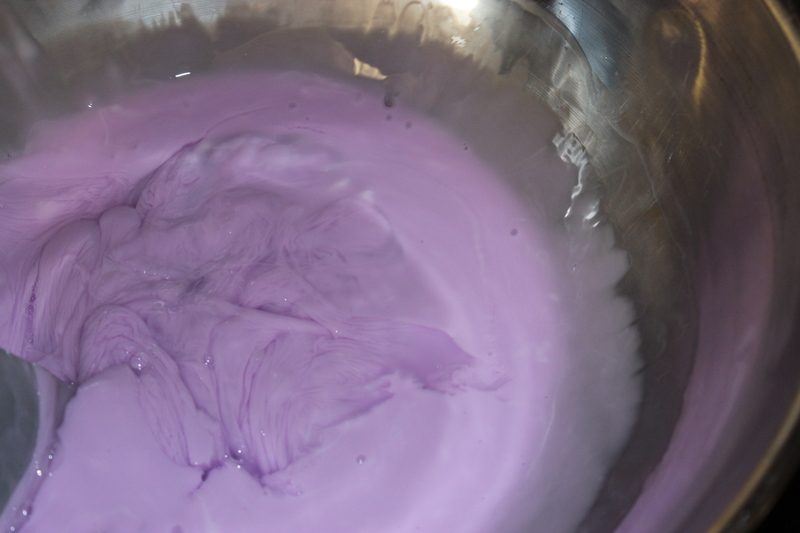 The batter was too heavy, so I added water mid way through the batch. Being a girl who enjoys carrots and pineapple, I did enjoy the pancakes. But for my kids’ sake, I will drop the pineapple off the recipe and try again the next time I have an abundance of carrots in the fridge. 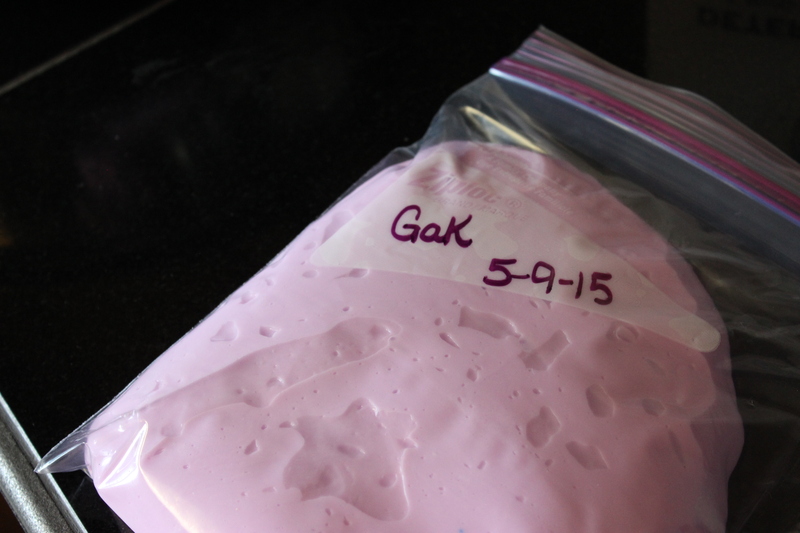 Another fun Did It…GAK. 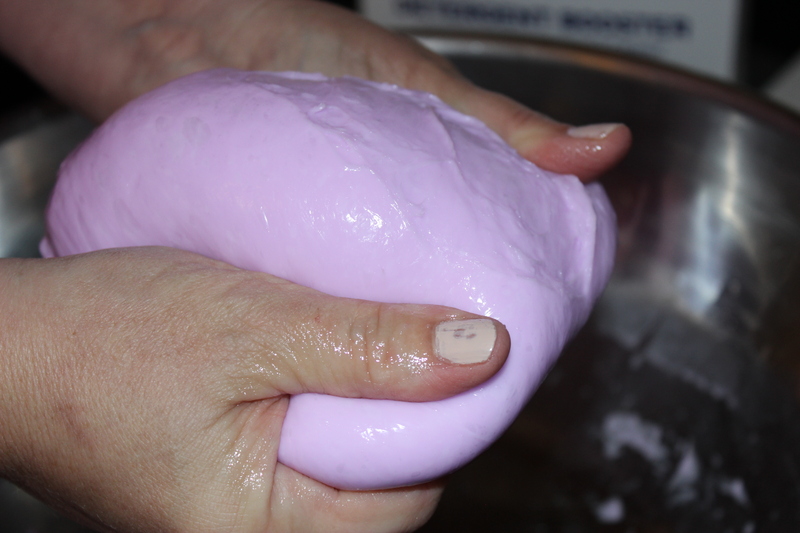 This was a fun DIY and my grand daughter was not the only one who had a lot of fun playing with the GAK. I love how quickly this project was completed, maybe 10 minutes total! 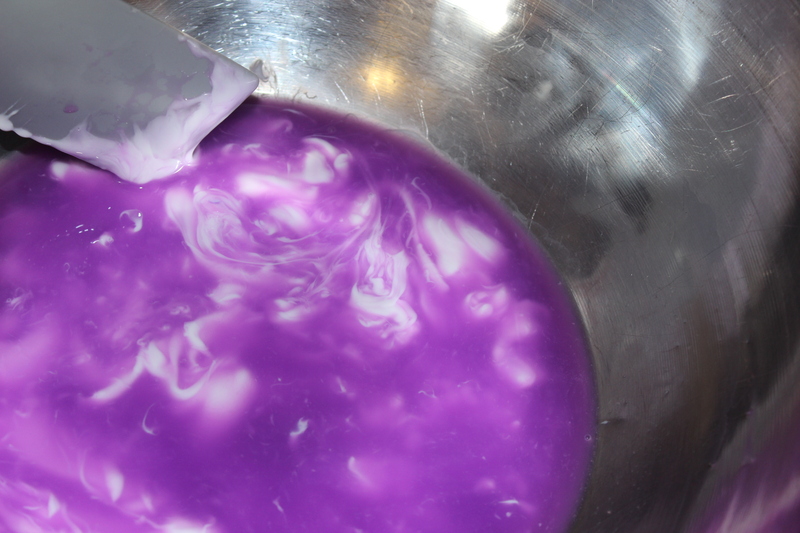 All you need to make GAK is a 7 or 8 oz bottle of Elmer’s Glue, Food Coloring, Water, Borax, a large bowl and storage containers. 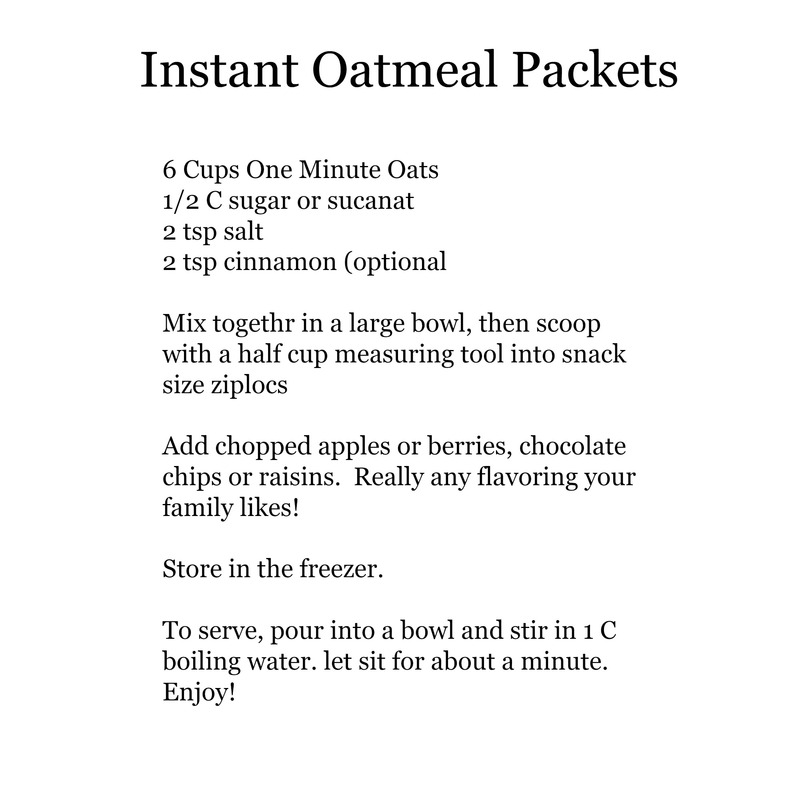 Here is the recipe I used. I am really looking forward to this summer challenge, of DOING my pins. How about you? Do you regularly do what you pin? Or do you need some inspiration to choose some pins and do those activities?